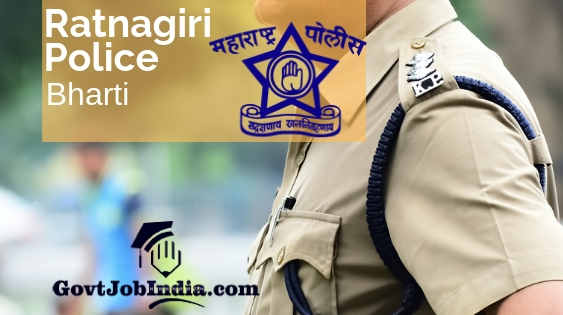 Ratnagiri Police Bharti 2019 Apply Online- All candidates who wish to apply online for the Ratnagiri Police Bharti will find the details of the recruitment given in the following sections. The recruitment is for the posts of constable and candidates from across the state can apply for this recruitment notification. Candidates can who are truly interested to apply online for the Ratnagiri Police Constable Bharti 2019 can check the recruitment details enlisted below and see if they are suitable for the posts. Check if you fit in the Police Bharti Maharashtra Eligibility criteria and age limit. Also, gather information about the salary scale and the other vital specifics of this Ratnagiri Police Constable recruitment 2019. So, this amazing employment news was published on the official website of the recruitment board, which are mahapolice.gov.in/Recruitment and mahapolice.mahaonline.gov.in. You will have to apply online from either of these websites. Worry not, because we will give the official link through which you will have to apply online for this recruitment when the official advertisement is published. Furthermore, please keep in mind that we will help you out in case of any difficulties you face regarding the Ratnagiri Police Recruitment. As the official PDF is not out yet, we are unable to provide you crisp details of this. But do know that we will be updating this page with any reliable information we can find. So, we would advise you to bookmark this page so that you don’t lose us and our latest updates about the Maharashtra Police Bharti. In addition, do not forget to check out the Maharashtra Mega Bharti which a mammoth initiative is taken by the state government for employing talented individuals in the govt sector. So, now that you are almost aware of the specifics of the रत्नागिरी पोलीस भरती recruitment, we are taking you to the recruitment table where you would find all the vacancy details. Qualified applicants in this Ratnagiri City Police Department, will get a pay scale of 5,200 to 20,200 Rs. (Grade Pay – 2,000 Rs.) with Special Pay 500 Rs. and Other. You will need to keep a few things ready before you apply online. These are-:- Applicants’ First name, Middle name, Last name, Fathers name, Mothers name, Date of Birth, current active mobile number, photograph, signature and Adhaar card number. How to Apply Online for the Ratnagiri Police Recruitment 2019? All interested candidates are urged to start off by filling an Online Application Form on www.mahapolice.mahaonline.gov.in. for applying for the Ratnagiri Police Recruitment. Please keep your Passport Size Photograph and a soft copy of your while filling the online application form. You are required to pay the application fee through Debit or Credit card. After paying your application fees, you are supposed to get a confirmation message on your mobile and then your Ratnagiri Police Bharti application will be completed. After submitting your application form, print the form for later uses and references. We wish you all the best for the Ratnagiri Police Bharti 2019. We hope you get selected and we were the ones to lead you to it. Furthermore, if you have any friends who might be interested in taking part in this recruitment, share this article to them. Furthermore, leave all the doubts you have in the comments section and we will clear it out to the best of our abilities as soon as possible. In conclusion, make sure that you subscribe and bookmark our website @GovtJobIndia.com for the latest updates about the newest govt job notifications.